My sister amazes me. Each time we meet, she has a new recipe to share and treat me to. She is definitely a far better cook than I. Actually both my sisters are better than me. But irony is that I am the ‘Food Blogger’. Fate played its hand on me, I guess. I need to remember the ingredients, the proportions each time I wanna create something, but they (my sisters) can see someone cooking and replicate without effort later. Kudos to them. But alas I don the hat of a food blogger. My trip to home-town this year coincided with my younger sister and her kids visit. There were 4 kids under the age of 5 and 3 women trying to control them. OMG!! My mom finally gave up and told us to not plan and come together next year. HAHAHAHA! Is that possible? No. I will still go same time and my mom will enjoy and get overwhelmed too. But I believe that’s the fun of visiting grandparents in summer vacations! Yoo hoo! Here we come again mom! I mean next year. ;) I digress. 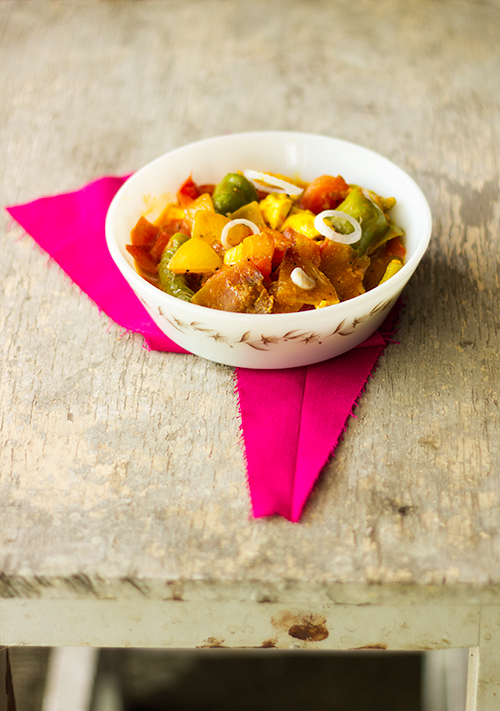 Paneer Do Pyaza, as the name suggests is a dish made with cubes of paneer, onion and bell pepper. It is served with little gravy allowing the ingredients to retain their shape and character. It is quite simple to put together. It tastes perfect with a plain Indian flatbread like chapati or a rich butter naan. The beauty of this dish lies in the color and ease of accompanying it with most breads. 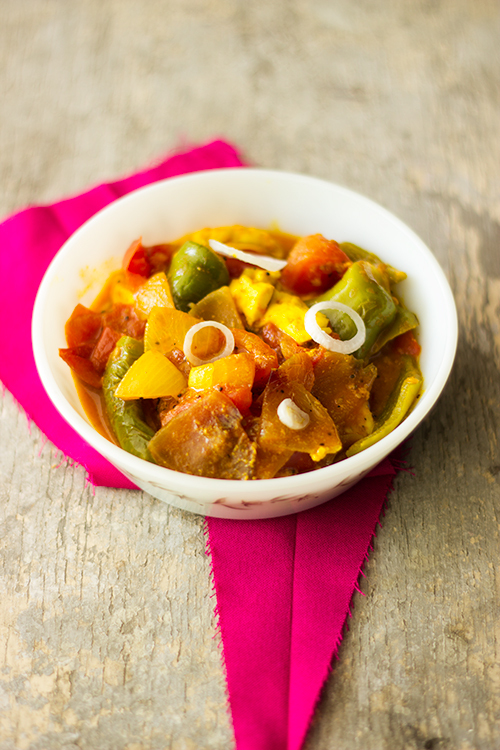 A perfect dish to go with butter naan or a plain roti. It is colorful and healthy too packed with protein and minerals. Very easy to prepare. In a thick bottom pan, heat oil. Add asafoetida and mustard seeds. Allow the seeds to splutter. Add cubed onions and sauté till soft. Add cubed pepper & tomatoes. Mix well. Add all spices and ketchup (sauce) except milk and paneer. Cover the pan and cook on slow flame till the vegetables are tender, about 8-10 minutes. Add milk or cream and allow it to come to a boil. Add paneer cubes. Adjust salt to taste. 1. You can replace paneer with tofu. 2. For a richer version use cream in place of milk. 3. The gravy needs to be little, making the dish sticky rather than runny.